Today we will learn about what is TIG welding its principle, working, equipment’s, application, advantages and disadvantages with its diagram. TIG stands for tungsten inert gas welding or sometimes this welding is known as gas tungsten arc welding. In this welding process, the heat required to form weld is provided by a very intense electric arc which is form between tungsten electrode and work piece. In this welding a non-consumable electrode is used which does not melt. Mostly no filler material is required in this type of welding but if it required, a welding rod fed into the weld zone directly and melted with base metal. This welding is mostly used for welding aluminum alloy. TIG welding works on same principle of arc welding. In a TIG welding process, a high intense arc is produced between tungsten electrode and work piece. In this welding mostly work piece is connected to the positive terminal and electrode is connected to negative terminal. This arc produces heat energy which is further used to join metal plate by fusion welding. A shielding gas is also used which protect the weld surface from oxidization. The first unit of equipment’s is power source. 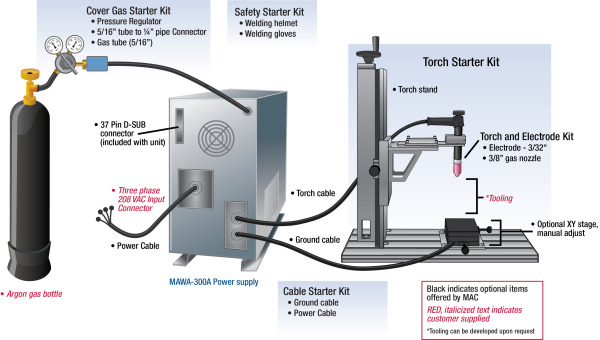 A high current power source needed for TIG welding. It uses both AC and DC power source. Mostly DC current is used for stainless steel, Mild Steel, Copper, Titanium, Nickel alloy, etc. and AC current is used for aluminum, aluminum alloy and magnesium. Power source consist a transformer, a rectifier and electronic controls. Mostly 10 – 35 V is required at 5-300 A current for proper arc generation. It is a most important part of TIG welding. This torch has three main parts, tungsten electrode, collets and nozzle. This torch is either water cooled or air cooled. In this torch, collet is used to hold the tungsten electrode. These are available in varying diameter according to diameter of tungsten electrode. The nozzle allows the arc and shielded gases to flow into welding zone. The nozzle cross section is small which gives high intense arc. There are passes of shielded gases at nozzle. The nozzle of TIG needs to replace in regular interval because it wear out due to presence of intense spark. Normally argon or other inert gases are used as shielded gas. The main purpose of shielded gas to protects the weld from oxidization. Shielded gas does not allow coming oxygen or other air into welded zone. The selection of inert gas is depends upon metal to be welded. There is a system which regulates the flow of shielded gas into welded zone. Mostly for welding thin sheets no filler material is used. But for thick weld, filler material is used. Filler material is used in form of rods which are directly feed into weld zone manually. Working of TIG welding can be summarized as follow. electrode is connected to the negative terminal of power source and work piece to positive terminal. This current supplied form a spark between tungsten electrode and work piece. Tungsten is a non –consumable electrode, which give a highly intense arc. This arc produced heat which melts the base metals to form welding joint. The shielded gases like argon, helium is supplied through pressure valve and regulating valve to the welding torch. These gases form a shield which does not allow any oxygen and other reactive gases into the weld zone. These gases also create plasma which increases heat capacity of electric arc thus increases welding ability. For welding thin material no filler metal is required but for making thick joint some filler material used in form of rods which fed manually by the welder into welding zone. Mostly used to weld aluminum and aluminum alloys. It is used to weld stainless steel, carbon base alloy, copper base alloy, nickel base alloy etc. It is used to welding dissimilar metals. It is mostly used in aerospace industries. TIG provides stronger joint compare to shield arc welding. The joint is more corrosion resistant and ductile. Wide verity of joint design can form. It can be easily automated. This welding is well suited for thin sheets. It provides good surface finish because negligible metal splatter or weld sparks that damage the surface. Flawless joint can be created due to non-consumable electrode. More control on welding parameter compare to other welding. Both AC and DC current can be used as power supply. Metal thickness to be weld is limited about 5 mm. It required high skill labor. Initial or setup cost is high compare to arc welding. This is all about TIG welding, principle, working, equipment’s, application, advantages and disadvantages. If you have any query regarding this article, ask by commenting. If you like this article, don’t forget to share it on your social networks. Subscribe our channel for more interesting articles. Thanks for reading it. Brazing vs Welding vs Soldering : Which is better?